The MageDelight Product Parts Finder module is an outstanding tool for improving default search options for Magento 2 merchants. With the extension, website visitors get the possibility to look for what they precisely need using multiple filters. The Product Parts Finder extension brings highly required features to any ecommerce business, but mainly online shops selling electronics, car spare parts, mobile accessories, and other products with an extensive set of attributes. The module provides ecommerce sites with advanced search filters that can be inserted in any block or page of an online store. Store visitors can quickly cut down search results by applying relevant filter options to all products or a product category. Merchants can create an unlimited number of product parts finders and improve performance with extensive data. 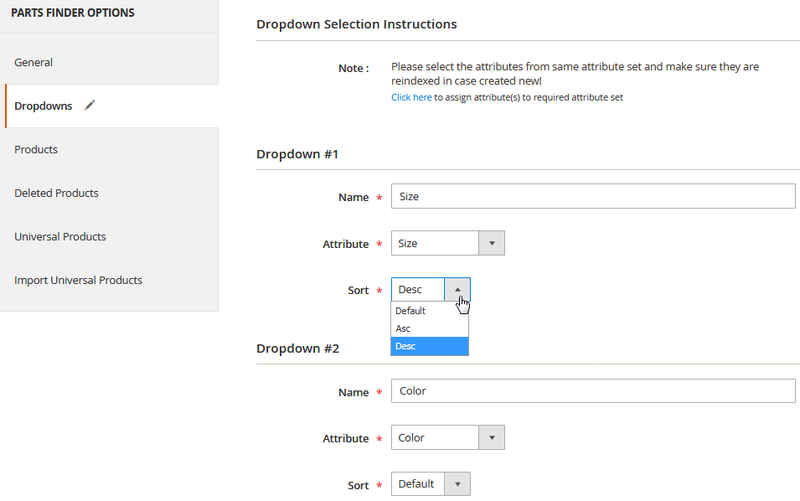 Magento admins can also import product lists for drop-down search values using CSV files. Below we describe the module’s functions in detail. 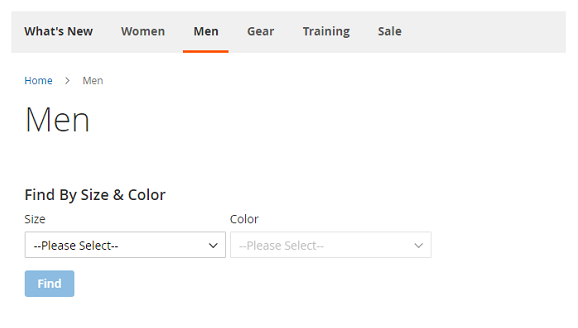 With the plugin, Magento admin users can create different product filters, like Year-Make-Model, Size-Color, and more. Product filters provide customers with extended search options helping them find the goods they need faster. The module generates a unique code for each product parts finder you create in the backend. With this code, you can place your product filters on a homepage and any category or CMS pages of your online shop. 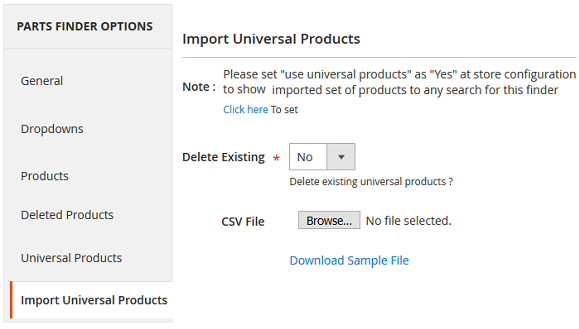 You can upload a list of universal products in bulk using a CSV file. Universal products will be displayed for all search attribute criteria. Store admins can set an unlimited number of drop-down filters using product attributes and assign a sort order for their display on the frontend. Products for the drop-down filter values are loaded dynamically on the frontend. Admins can edit the products in the loaded list if necessary. If only one product appears in a search result, you can configure the extension to redirect store users to a product page. The Product Parts Finder extension allows admin users customise parts finder options. You can set any name to be shown as a title of search attribute on the frontend, create the text for a “Find” button, and choose a vertical or horizontal layout for a parts finder display. With the module settings, website visitors enjoy improved user experience having the option to filter the products, search within a product category, and view only related items. Frontend users can autosave selected filter options. In this way, users will not need to use a parts finder again if they browse your store after applying search parameters to filter the goods. 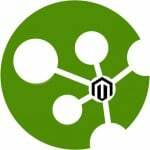 Here we will show how to configure the MageDelight Product Parts Finder extension in the Magento Admin. After you install the extension on your store, first, you will need to configure your license keys. To go to the License Configuration section, navigate to Stores → Configuration and select MAGEDELIGHT → Parts Finder from the left-side menu of the page. When you purchase the extension, you will get an email with your serial and activation keys. You should enter these keys in the License Configuration. After you enter and save serial and activation keys, available website domains will be displayed in the “Select Website” field of the General Configuration section. You can select single or multiple domain names from the domain options. To use the extension on your website, select Yes in the “Enable Module” setting. In the General Configuration section, you can also enable parts finder to be displayed on the homepage of your store, and select which parts finder to show from the available options in the drop-down menu. You can add more parts finder options from the Parts Finder → Product Parts Finder menu in the admin panel. We will have a closer look at these settings below. If you select Yes in the “Use universal products’ setting, this will add an imported list of universal products to every search with a product parts finder. Options for enabling “Find” button define how your website users can search a parts finder. With the options provided here, the “Find” button can become available if whether a single drop-down value or all dropdown values are selected. With the extension’s features, store admins can decide to redirect visitors to a product page if only a single product is found in search results by enabling this in the relevant setting. In the “Find button text” you can write any text you like. Now we will describe how to configure your product parts finders in the Parts Finder → Product Parts Finder menu. In the Product Parts Finder grid, you will see the records of all available product parts finders. By clicking Select in the Action column, you can edit or delete each record. To create a new product parts finder, click on the “Add New Parts Finder” button in the top right corner of the page. In the opening page, you can set the options for your new parts finder. First, you need to configure General settings of the Parts Finder Options. Here you can create any name for your parts finder as a “Title”, set the number of dropdowns for a search attribute, choose either vertical or horizontal display type in the “Template”, and enable the parts finder in the “Status”. After saving your settings, you will see a screen like the one shown in the example below. 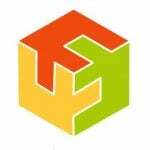 The extension generates a code that you will use to place a parts finder filter on any CMS or category page of your website. You should keep in mind that only one product parts finder can be used per a page. In the Dropdowns tab of the Parts Finder Options, you can set product attributes of your parts finder to provide advanced filters for the frontend users. Here you specify the name that will be used as a dropdown caption, choose search attribute and the sort order, either default, ascending or descending. The module loads products dynamically from the products catalogue for the selected attributes. You can edit or delete any product in the list, in case a product has been updated in the catalogue. In the Deleted Products tab, you can view the list of deleted products and recover them whenever required. Universal Products tab displays the products that have been imported from CSV file. Universal products will appear in all search results on your web store. To import universal products in bulk, go to the Import Universal Products tab. Here you can select a CSV file with the list of universal products to upload or download a sample file to use for a CSV template. In this tab, you also decide whether to delete existing products when importing new ones. 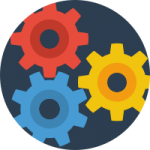 As mentioned in the backend configuration above, the Product Parts Finder plugin generates a parts finder code that you can manually insert in any block or CMS pages of your website. Below you will find the examples of a parts finder on different pages. 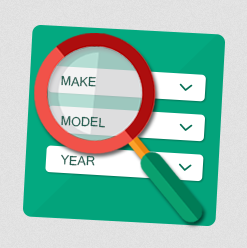 Product parts finder with the year, make, and model search attributes displayed on a homepage. A customer can search the products by selecting one, a few, or all attributes. 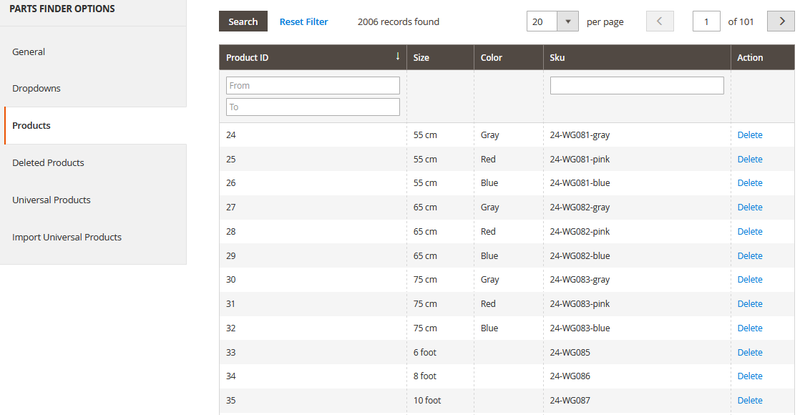 Product parts finder with size and colour search attributes on the “Men” category page. In this example, the button “Find” becomes clickable after a frontend user selects both size and colour options. Product parts finder on a CMS page. 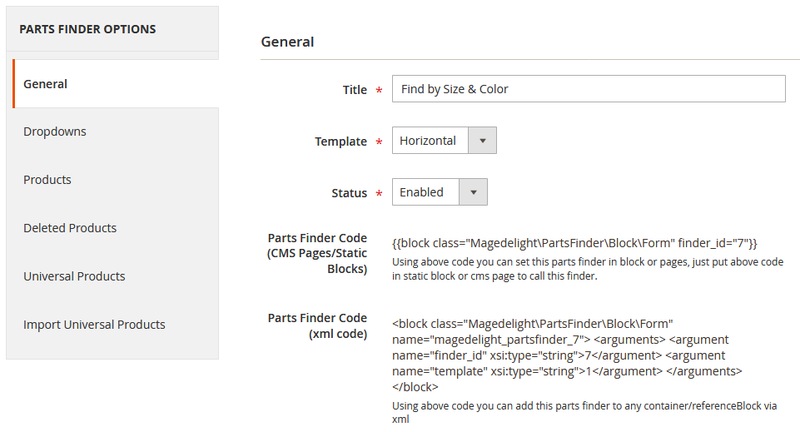 The MageDelight Product Parts Finder extension provides a necessary improvement of default Magento 2 search features. The extension lets online shoppers quickly find the items they need, makes search results more precise and helps admin users configure enhanced product search settings. The cost of the MageDelight Product Parts Finder module for Magento 2 is $199. With the purchase, you get free lifetime updates, free customer support for 180 days, and a money-back guarantee during 45 days. Installation service and extended period of support can be purchased for the extra price.